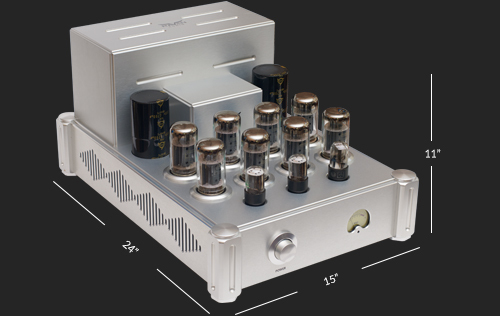 This amplifier has no equal in any price range whether tube or solid state. You must experience it to believe. It is literally otherworldly! This amplifier has no equal in any price range weather tube or solid state. You must experience it to believe. It is literally other worldly! If you listen to acoustic instrument recordings like a symphony orchestra, it is the closest representation to being there possible. If you listen to multi-track recorded music in a studio like most other music, it is magical and otherworldly! The Shaman can drive the most expensive and exotic speakers in the world, to musical heights they have never achieved before. Strangely enough, it can make many more reasonably priced speakers sound nearly as good. The Shaman's unbelievable power is in part derived from a custom Raven power transformer designed specifically for the Shaman. The power supply alone weighs in at over sixty pounds. Raven Audio's proprietary transformers are designed to the highest specifications, are built in the U.S.A. and crafted to last a lifetime. The Shamon's unbelievable power is in part derived from a custom Raven power transformer designed specifically for the Shamon. The power supply alone weighs in at over sixty pounds. Raven Audio's proprietary transformers are designed to the highest specifications, are built in the U.S.A. and crafted to last a lifetime. Dimensions: W 15" x D 24" x H 11"